Buckland services is a restaurant and forecourt operation, built alongside the A420 between Oxford and Swindon. The service area is built on the site of a bungalow called Cranford, built in 1963. In 1978 a petrol station was built next to it. In 1985 the first plan emerged to turn the bungalow into a restaurant and build a large parking area. This was refused planning permission, and other sites at the roundabout at Kingston Bagpuize. In 1988 plans were put forward by Mobil and Forte to demolish the bungalow and build a restaurant and refurbish the petrol station, leaving space for a single-storey Travelodge at the back. The restaurant brand wasn't named and may not have been decided. In 1992 the restaurant plan emerged again, this time naming it as Little Chef. This opened with a small, stone-cladded building. Plans to add a Travelodge continued, this time with a two-storey building. The restaurant was extended to gain a Coffee Stop, but closed February 2012, citing low trade. In June 2014 it re-opened as 'Chariots & Cherry Pie', but it closed the following November. The site was purchased in early 2018 and underwent major redevelopment works which involved demolishing the remaining empty restaurant building. 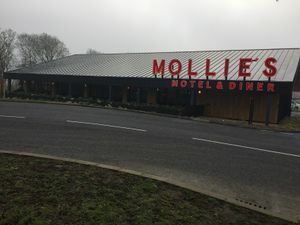 The new site reopened in January 2019 with a new restaurant, general store and motel branded under the name of 'Mollie’s'. The filling station was demolished in 2016 and rebuilt again.